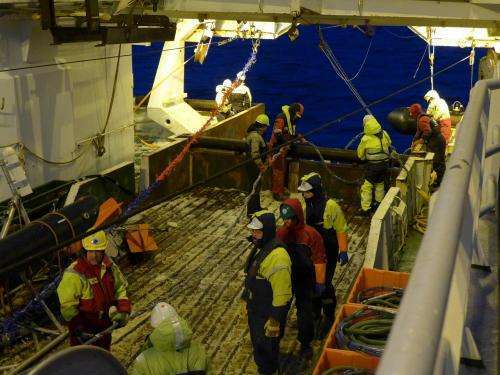 University of New Hampshire geologist Joel Johnson (center, with beard) prepares to collect seismic data on board the research vessel Helmer Hanssen in the Fram Strait. Credit: Courtesy of Joel Johnson. Research led by a University of New Hampshire professor has identified a new source of methane for gas hydrates—ice-like substances found in sediment that trap methane within the crystal structure of frozen water—in the Arctic Ocean. The findings, published online now in the May 2015 journal Geology, point to a previously undiscovered, stable reservoir for abiotic methane - methane not generated by decomposing carbon - that is "locked" away from the atmosphere, where it could impact global climate change. "We've found an example where methane produced at a mid-ocean ridge is locked up in stable, deep water gas hydrate, preventing it from possibly getting out of the seafloor," says lead author Joel Johnson, associate professor of geology at UNH and guest researcher at the Center for Arctic Gas Hydrate, Environment and Climate (CAGE) at UiT The Arctic University of Norway in Tromsø. Johnson notes that the findings, which pinpointed a source of abiotic methane ¬produced in seafloor crust, indicate gas hydrates throughout the Arctic may be supplied by a significant portion of abiotic gas. The study, "Abiotic methane from ultraslow-spreading ridges can charge Arctic gas hydrates," focused on the Arctic mid-ocean ridge system, one of two so-called ultraslow-spreading ridge regions on Earth. Scientists have known that abiotic methane can be generated in these ridges through a process called serpentization, which involves the reaction of seawater with hot mantle-derived rocks exposed during slow to ultraslow mid-ocean ridge spreading. 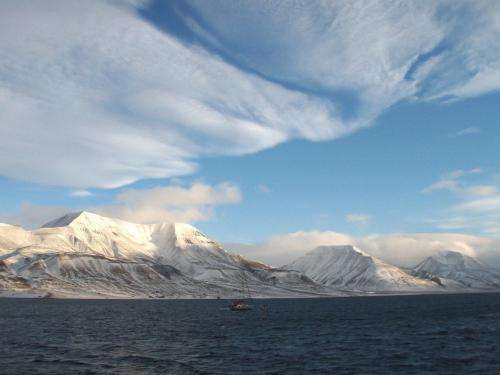 Looking toward Svalbard, an archipelago off the coast of Norway, from the Isfjorden fjord. Credit: Joel Johnson. While on sabbatical last year (2013-14) at CAGE, Johnson and his co-authors from that institution embarked on two cruises in the unique geologic and oceanographic region called the Fram Strait, a deep, narrow gateway to the Arctic Ocean between Greenland and the Norwegian archipelago of Svalbard. There, fast-moving currents move sediment, uncommon on most mid-ocean ridges, into sediment drifts that cover the ridges. Using a seismic data acquisition system, they found a methane hydrate system within those sediments. The discovery surprised the researchers. "We didn't know whether or not abiotic methane could supply gas hydrate systems so close to mid-ocean ridges" Johnson says. "It had been thought that mid-ocean ridge environments might be too hot for gas hydrates to be stable." Indeed, those methane hydrates are remarkably stable: The researchers showed that the hydrate system is long-lived, about two million years old. Further, because the hydrates exist under very deep water - more than 1500 meters - the methane is less vulnerable to potential release due to changing sea levels or ocean warming. Such stability has important implications for climate change; as a greenhouse gas, methane is 20 times more potent than carbon dioxide. "This work shows there are parts of the Arctic where abiotic methane is coming up to the seafloor and instead of coming out, it is trapped in gas hydrates; it's finding itself in a stable environment for millions of years," says Johnson. Where climate change is concerned, he adds, "this is not the part of the gas hydrate system that is most susceptible to change in a warming Arctic Ocean." Although his focus is on the crust of the Earth, not interplanetary space, Johnson notes that these findings are interesting, as some researchers have suggested abiotic methane formed by serpentinization may exist and reside as gas hydrates on Mars. And as gas hydrates gain popularity as potential fuel for the future here on Earth, the energy sector is likely to take notice as well. "This is a new source of methane for gas hydrates in the Arctic that could be quite extensive," Johnson says. See, if we stopped using oil, which doesn'tnaturally leak as much, we could cut total emissions by just using the Methane from deposits that naturally leak. "Indeed, those methane hydrates are remarkably stable: The researchers showed that the hydrate system is long-lived, about two million years old". And over that two million years, temperatures have been higher than now, a number of times. So, if the methane hydrates have been remarkably stable, why would this be a "new source for methane"?